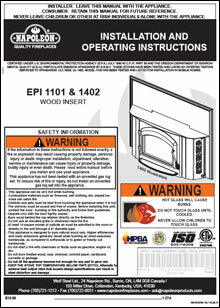 hearth mount installation in either masonry or factory built fireplaces. This stylish insert has an elegant, full view single door, standard “WHISPER QUIET” heat circulating blower & thermostatic sensor.With its innovative design, the Napoleon 1101 transforms small amounts of wood into large amounts of cozy heat.The 1101 insert can be customized with an optional cast iron surround kit, which is available in a variety of porcelain enamel or painted finishes that will enhance your decor. Surrounds and doors are sold separately.